By Noelle Jones. First published 2015. Much of the character of Melbournes tramway infrastructure was shaped by two architects. During the M&MTBs massive expansion of its network over the 1920s and 1930s the built environment was the responsibility of A.G. Monsborough. In the decade prior to the creation of the M&MTB in 1919, the pre-eminent tramway architect was Leonard John Flannagan. These two men were responsible for a relatively large body of tramway infrastructure that is still in use today. They were however not the only ones working in this field  many other leading Melbourne architects also undertook tramway commissions, including Twentyman & Askew (MTOC Building, 1891), Ussher & Kemp (NMETL power station, 1905-06) and Frank Stapley (timber tram shelters, 1916-7). Unlike Monsborough, who was a full-time employee of the M&MTB, Flannagan ran his own practice (with, at various times, different partners). Over a relatively brief period Flannagan was engaged to undertake a number of commissions by both the Prahran and Malvern Tramway Trust (PMTT) and the Hawthorn Tramway Trust (HTT). In fact, tramway commissions comprised only a small part of Flannagans output, yet these works are possibly some of his best-known buildings. Records of various Flannagan designs  including drawings and specifications  are available at the State Library of Victoria. His drawings for Hawthorn Depot are on display at the Melbourne Tram Museum  they are striking examples of the arts of drafting and lettering. Detail of Leonard Flannagans 1887 architectural plan for a residence at Mendip Hills, Preston North (now demolished). From Miles Lewis (1977), Architectural drawings as historical sources, The La Trobe Journal. Leonard Flannagans father, John, was one of Melbournes leading early architects. Flannagan senior was born in Manchester, England in 1838 and was educated in Ireland. He was subsequently articled to an architect named Fogarty, who had practices in both Dublin and Limerick. Hotham (North Melbourne) Town Hall, 1875 (second prize). He married Louisa Woolcott on 29 October 1862 at Christ Church, South Yarra. Leonard was born in Richmond in 1864 and was the eldest of six children, two of whom died at birth. Leonard was educated at St James Grammar School, on the corner of Bourke and William Streets. John Flannagan also won the 1871 Melbourne City Council competition for the new Eastern Markets, however the Council did not proceed with his proposal. In 1874 the Council conducted a second competition for the Eastern Markets, with a requirement that shops were to be provided along the street frontage  a unique characteristic of Flannagans winning design. Flannagan refused to compete and was supported by the Victorian Institute of Architects, which also advised its members not to participate in the competition. After considerable public controversy the commission was awarded to Reed and Barnes. John Flannagans last building was dated 1879  that same year he became ill. He died on 16 September 1882 at his home in 67 Erin Street Richmond. Under an agreement with his widow Louisa (executrix of his estate), his practice was taken over by George Jobbins, with the business then becoming known as Flannagan & Jobbins. This agreement was terminated in February 1884. Over a career of more than 50 years, Leonard Flannagans architectural designs encompassed a wide range of styles that represented the leading edge fashions of the day  progressing from Gothic, to 1880s Italianate, then Queen Anne, Arts and Crafts, and the informality of Californian bungalows. Flannagan was an early adopter of innovative building techniques and materials, such as cavity exterior walls, fibrous plaster and reinforced concrete. He also employed open planning principles  that is, an informal plan in which rooms opened onto each other rather than via a passage  since the turn of the twentieth century. Another innovation was the common room which Flannagan used in a 1919 design for a cottage in Lismore for his brother-in-law. Such combined living and dining rooms were not to become accepted for many years. While much of Flannagans work was residential, his output also included a wide range of commercial and other commissions, including shops, offices, warehouses, farm buildings, schools and churches. He was articled at his fathers firm over the period 1880-85, at which point he established his own practice at 75 Chancery Lane (the previous name of the section of Little Collins Street between Queen and William Streets  when the street was renamed the address became 450 Little Collins Street). 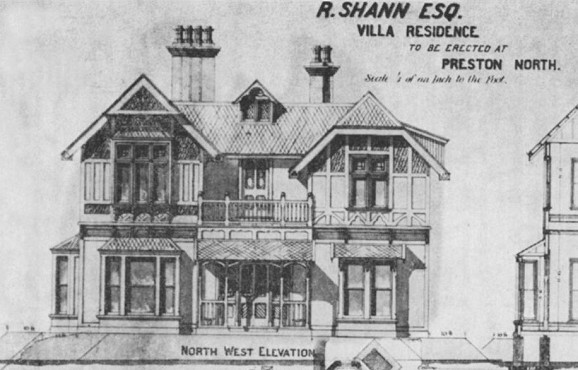 In 1884 Flannagan won third prize in the category for a villa costing less than £750 in the competition conducted by the Grace Park Syndicate which was then subdividing the Grace Park Estate in Hawthorn. In 1890 Flannagan built his own home, Aloha, at 31 Thanet Street Malvern, prior to his marriage to Alice Julia White on 30 August that same year. This house was in Italianate style, which was becoming increasingly popular, with a plan fairly typical of the late 1880s . Dr J.T. Kennedy and family at Lisfarron, Cobram, c1900. Flannagan designed the residence in 1889. From Moira Shire Stage Two Heritage Study. One of the most outstanding of Flannagans designs is the residence Darnlee, built in 1899 at 33 Lansell Road, Toorak, for a Mr C. McIntyre. It is described by Heritage Victoria as a particularly finely detailed and essentially intact example of the Federation Queen Anne style, which was the dominant style in Australian domestic architecture immediately before and after 1900. Darnlee was converted to an aged care facility in the 1990s, after use as a Womens Auxiliary Air Force (WAAF) hostel during World War II and subsequently taking various other government roles. Flannagan was an active member of the Victorian Institute of Architects (which became the Royal Victorian Institute of Architects in 1888). He was elected as an associate in 1881, and a full member in 1887. In 1891 he was elected a Fellow of the RVIA and was appointed Assistant Honorary Secretary from 1897. Flannagan also belonged to a number of Melbournes gentlemens clubs  including the Yorick Club (of which his father was also a member), the Savage Club and the Melbourne Cricket Club  in addition to being a Freemason. Contacts gained through such networks would be invaluable and indeed many of the citys leading architects were members of various clubs. It is evident that by the very early 1900s, if not before, Flannagan would have been known to Alex Cameron. Both were members of the Yorick Club and both lived in Malvern. Cameron was elected to the Malvern Town Council in 1902, and shortly thereafter was appointed as the Malvern representative to the Melbourne and Metropolitan Board of Works (MMBW). In 1903 Flannagan was engaged as one of three architects for the Melbourne and Metropolitan Board of Works (MMBW), where he was responsible for checking houses for damage prior to the MMBW blasting for the installation of sewers. After an extensive campaign to encourage State Parliamentary support for electric tramways, Alex Cameron was appointed the first Chairman of the PMTT in 1908. Flannagans first tramway commission was the Malvern Depot building in Coldblo Road, Malvern for the PMTT. The Edwardian style used was popular at the time for commercial buildings. Flannagan was responsible for the triangular shaped office building added in 1911-12. Malvern Depot was the first and largest of the depots constructed for the municipal tramway trusts prior to the formation of the M&MTB in 1919. These early buildings at Malvern are relatively intact  although they were extended significantly by Monsborough  and according to Heritage Victoria are in the Federation Free Classical style. As the PMTT tram network expanded, the need for electricity generation increased. The first (and only) freestanding substation constructed for the PMTT was designed by Flannagan in an Edwardian style. This substation, in Rusden Street, Elsternwick, was built in 1914. 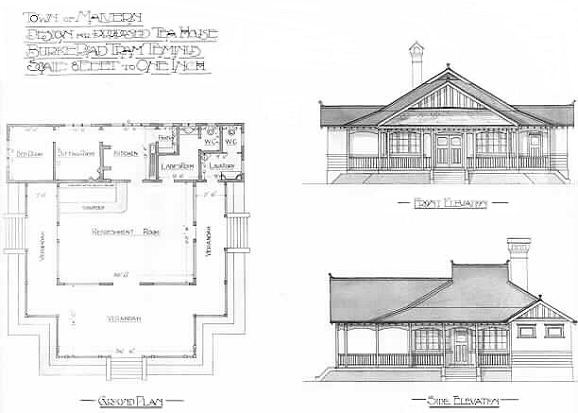 Flannagans1910 architectural drawings for a proposed tea house in Central Park, Malvern, at the Burke Road terminus of the Wattletree Road tram route. Courtesy of the Stonnington History Centre. His next major tramway commission, also for the PMTT, was the 1915 Kew Depot building, in High Street, Kew, and later in the same year, Flannagans Hawthorn Depot building for the HTT was completed. These two depots have a number of similar design features  most noticeably the use of large arched windows  and represent a progressive change in style from the Edwardian Malvern Depot, to the American Romanesque Hawthorn Depot. Flannagan also designed a variety of tram shelters for both the PMTT and the HTT. The PMTT shelters were built over the period 1912 to 1917 and were of two types: rustic Edwardian  and verandah style . The HTT shelters  were considerably less elaborate than those produced for the PMTT and were built around 1917. The municipal tramway trusts were absorbed into the M&MTB in 1919. We have found no evidence of Flannagan undertaking any work for the newly formed statutory authority. By the mid-1920s all M&MTB architectural work was conducted in-house, and in 1926 Melbournes second great tramway architect, A.G. Monsborough, was appointed head of the M&MTBs Architects Department. 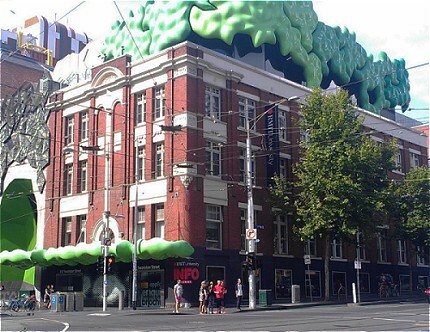 RMIT Building 22 in December 2014, originally designed by Flannagan in 1912 as a factory for Welch, Margetson & Company Pty Ltd. The Mornington Peninsula, south-east of Melbourne, was and still remains a popular holiday destination for Melbournians. According to Robin Boyd  its western foreshore along Port Phillip Bay was a testing ground for innovative domestic architecture  he claimed that nearly every architect of note that worked in Melbourne built a house there at some time. Flannagan was no exception. In 1912 he built his own house at Lot 3 Bath Street Mornington (now demolished) and subsequently undertook a number of commissions in the area. By 1916 he owned eight blocks of land in Bath Street and Marchington Avenue. 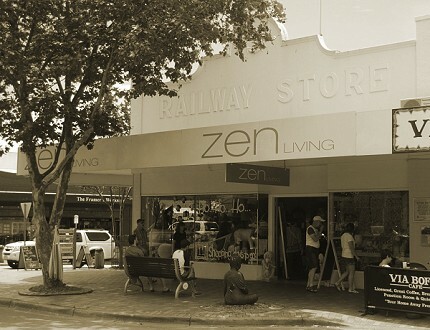 Railway Store, Mornington, December 2014. Building designed by Flannagan in 1916. He also become increasingly involved in local government. Flannagan was elected to the Mornington Shire Council in 1915, serving for three terms until 1924. In 1918 he was Mornington Shire president. He was also involved in the Foreshore Committee and the Mornington Progress Association, as well as being instrumental in arranging for Mornington to be connected to electricity and sewerage. He served as a Justice of the Peace over the period 1928 to 1945. During most of his time in Mornington Flannagan still maintained a Melbourne office  at 450 Little Collins Street until 1922, after which it moved to 443 Little Collins Street. He also had a Melbourne residence at 76 Tivoli Road, South Yarra from 1930. He sold the Bath Street cottage around 1925 and moved to Bona Vista, 19 View St Mornington. His office finally closed in 1936. 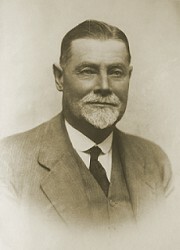 Flannagan died in Mornington on 2 November 1945, survived by his wife Alice, son Noel, daughter Doris and two grandchildren. Flannagans tramway work spanned less than ten years, however within that time he utilised a range of styles, from the relatively restrained Malvern Depot, to the more elaborate Federation Free Classical Rusden Street substation, and culminating in the American Romanesque Hawthorn Depot. On a much smaller scale, his tram shelters remain well-loved examples of early twentieth century street furniture, and indeed are an integral part of Melbournes character. 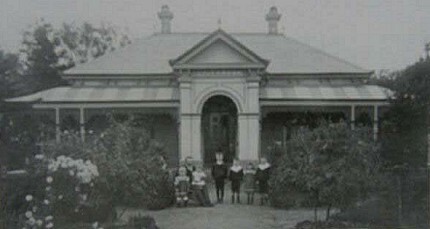 Glencara (1908), 6 Studley Park Road, Kew  now known as Whitty House. Many thanks to the Mornington & District Historical Society and the Stonnington History Centre for advice and assistance. Argus (1882), Deaths, 18 September 1882. Argus (1882), Special Advertisements, 30 December 1882. Argus (1884), Advertising, 22 February 1884. Argus (1884), The Grace-Park Designs, 24 June 1884. Argus (1890), Marriages, 27 August 1890. Argus (1945), Deaths, 5 November 1945. Argus (1945), Obituary, 10 November 1945. Australian and New Zealand College of Anaesthetists, Ulimaroa. Heritage Intelligence (2007), Moira Shire Stage Two Heritage Study 2007. Miles Lewis (1977), Architectural drawings as historical sources in The La Trobe Journal, No 20, December 1977. Miles Lewis, Australian Architectural Index. H. Okraglik (1983), John Flannagan: a biography & analysis, thesis, University of Melbourne. RMIT (2009), Design Standards Brief: Section 2  General Planning & Design Standards, Issue 6, 2009. Royal Historical Society of Victoria, Melbournes Streets and Lanes, Discovery Series No 2. In around 1920 Flannagan sold Aloha. The house became the St Leeor Private Hospital in 1939. When the hospital closed the building was sold and relocated to country Victoria. north-east corner of St Kilda and Commercial Roads, Melbourne (1915 original reconstructed in 2001 after severe damage). south-east corner of Balaclava and Orrong Roads, Caulfield (constructed 1916/17). south-west corner of the intersection of Camberwell Road and Bowen Street, Camberwell. Robin Boyd (1919-1971) was an influential Australian architect, author, critic and public educator who wrote extensively on Australian urban design.